Traditional media has been shaken to the core by an exodus to the web in the past few years. Some attribute the changes to the economy, while others point to growth in broadband and the general availability of information on the internet. This paradigm shift is most certainly an amalgamation of several factors, including perception of ad efficacy in various channels. Newspaper readership has dwindled and a sad few have closed their doors completely. 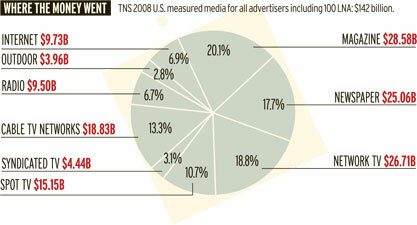 Subscriptions were down, but worse, the 2008 ad spend dropped nearly 30% in some categories.1 Reach and performance metrics acted as the harbinger in this dive, but the industry should not discount psychographic factors from both sides of the advertising fence. “The explosion in Consumer Generated Media over the last couple of years means consumers’ reliance on word of mouth in the decision-making process, either from people they know or online consumers they don’t, has increased significantly,” said Jonathan Carson, President of Online, International, for the Nielsen Company. Nielsen recently published some staggering numbers along with the assertion that “consumers trust real friends and virtual strangers the most”. Another statement made in this release urges advertisers to “be encouraged by the fact that brand websites are trusted at that same 70 percent level as online consumer opinions,”2 placing a thin veil over the curious demon that is tormenting both brands and their agencies: that online consumer opinion currently carries the same weight as brand websites. Reflecting on 2008 ad spend, we can envision multi-channel integrated campaigns where frequency still reigns supreme, but there are several key indicators of shift in message and delivery. What does this mean to an agency being approached with the question of Social Media? Rather than engage the insights and experience of established interactive agencies, some traditional agencies are forging the road ahead, attempting to develop expertise in-house, and finding the task to be formidable. In a recent interview, Alex Bogusky, Chairman of CP+B said, “we’ll see a lot of longstanding big agencies struggling.” Traditional media seems to be, he said, “freaking out.”6 CP+B has been venturing into the realm of Social Media recently, and have even put forth a beta site that leans heavily on consumer-generated content. Agencies looking to develop Social Media strategies internally are finding that some foundational marketing concepts must change. Of course, a successful Social Media campaign would first set out to identify groups in which the target demographic is active, yet base the overall strategy not on sites, but on goals. To participate effectively in this space means the abandonment of push messaging in favor of a more dynamic, conversational style. The message would be developed around a core set of questions that the target market would be expected to have curiosity around, and achieve frequency with timely delivery of on-message keyword phrases. Trust and credibility must fostered and developed by engaging the audience with as much transparency as possible. Listening is one of the most critical aspects, both conversationally and analytically, but it’s all too often missed. Recently, aspiring adman Byron King “infiltrated” Social Media, in an attempt to gain favor with CP+B, if not a job. King created a persona as an “Interactive Mole”7 with the stated goal of generating the type of buzz that would cause someone within CP+B to reference his work on Twitter. Ironically enough, the inside man that fell for the ruse was none other than	Wojtek Szumowski,8 CPB’s in-house sociologist, and posts related to King’s travails then dominated the front page of the CP+B beta site. King earned a LinkedIn recommendation from Alex Bogusky himself,9 but not a job.